The min/max ship condition is from minimum 30% to maximum 95% that you can repair from and to at sea. 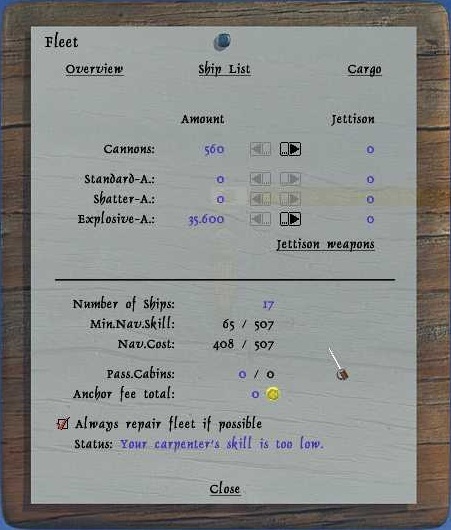 Max ship class is to what ship class you can repair, where maximum is class 9. Repair speed is how fast you repair. This means you need to find several carpenters. One with 30% and hopefully good other skills as well. One with class 9 and hopefully other good skills as well. Several with repair speed 9,9 the more you have, the faster you can repair. Complete list, for each ship class at bottom. Note that to repair at sea, you also need wood and cloth, in a three to one ratio. You also need to tick the box at always repair fleet if possible, in the right click menu under fleet. You need to be on ignore or trade mode and you need to be no sails or half sails, to repair. You can turn carpenters on and off in the quick bar, by pressing the hammer. At the store you can buy 94%, 95% and packs with 9,9 repair speed carpenters, all come with random other skills. Buy here the 94% Carpenter, 95% Carpenter and the carp six pack. Here is a list, of how many 9,9 carpenters you need, to repair each ship class from 30% to 95% in one go.